Description: NS 9089, 9201, 6173, 6686, 9090, 6516, 9680 and 8833 lead this NS train through Centralia. Description: NS unit pulling 2 cars in COLORADO??? Description: Sitting tied down just south of MO Jct. at Propane Crossing is UP Train MLIAS 20 with NS and CSX Power spliced by a Patched SP Tunnel Motor, which is now off the roster. Description: Westbound on track one with an ex-Con switcher trailing. Description: Behind the VFW, 0806 hours. Description: 145 continues a streak of generic power. Title: NS 9089 is crying! 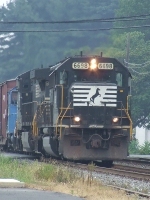 Description: NS 309 rolls by the depot in Olmsted Falls. Description: Eastbound Triple Crown Train 264 approaches Centennial Road led by NS 9089. Description: NS 22W comes into town.